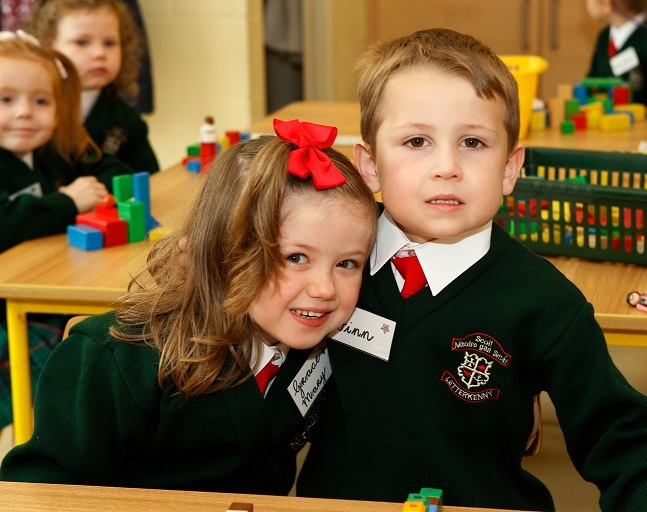 For two schools in Letterkenny, the return of their pupils for the new school year proved a little bit more special than normal on Monday morning. Scoil Cholmcille National School and Scoil Mhuire gan Smal are now both co-ed schools, which means that girls and boys can attend both. Up until now, only boys attended Scoil Cholmcille while for a long number of years, Scoil Mhuire gan Smal has been an all-girls school. Staff and teachers at both schools yesterday welcomed a new intake of pupils and with many local families availing of the opportunity to send their sons and daughters to the one school. Scoil Cholmcille marked their move to ‘co-ed’ by planting a beech tree in the school grounds at the end of the last school term, to signify strength and longevity. The school also unveiled two “buddy benches” to show how much friendship is valued in the school. School principal, Paraig Cannon said Monday was a special day for everyone involved. “We have over 40 girls enrolled with us for the year ahead,” he said. Mr. Cannon described the first day back to school as “very positive”. “It has brought an injection of life and energy into the school,” he said. Mr. Cannon said to mark the change, the school have also introduced a new school uniform for the infants classes, and the new uniform will be worn by all pupils from next September.